Employee Conflict: HR tips for managing conflicts between employees in the workplace. Business owners often struggle to keep their heads above water—drowning in HR administrivia and trying to ensure legal compliance in the workplace. It's important to remain compliant in order to stay viable, but it's frequently not our clients' strong suit. 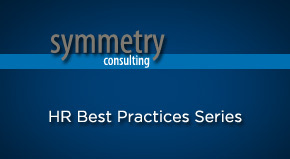 Symmetry can manage your HR needs so you can concentrate on your day-to-day business. We have developed three levels of support, so that no matter the size of your business or the scope of your HR needs, we've got you covered.